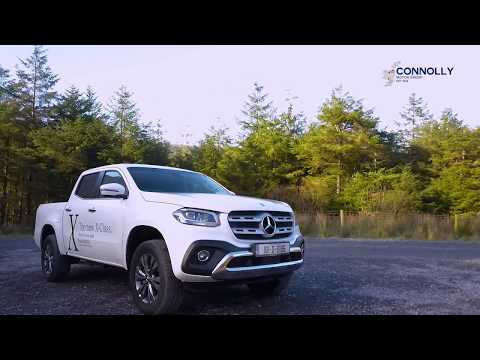 SCRAPPAGE DEAL of €6,000 against the new Mercedes-Benz X-Class! The X-Class shows character: the powerdomes on the bonnet, the front visual sump shield and the exposed wheel arches impress at first glance. After opening the doors you are met by a stylish interior with a horizontally structured cockpit. The clearly differentiated PURE, PROGRESSIVE and POWER lines combined with the stylish genuine accessories make the pickup even more your X-Class. As do the 48.3 cm (19 inch) alloy wheels and the LED High Performance headlamps in a typical flare design. There are 2 colour concepts in black leather or nut brown leather to choose from in the POWER line. The covering of dashboard and beltlines in ARTICO man-made leather as well as the trim elements in aluminium or a woodgrain-look are aligned to the high-quality leather appointments. From the comfortable front seats to the horizontally structured cockpit to the modern multimedia systems: it is all stylishly and carefully coordinated and immediately conveys a "welcome home" feeling. Amongst the 3 PURE, PROGRESSIVE and POWER lines there is something for every style. There are 2 colour concepts in black leather or nut brown leather to choose from in the latter. The covering of dashboard and beltlines in ARTICO man-made leather as well as the trim elements in aluminium or a woodgrain-look are aligned to the high-quality leather appointments. For more information or to book a test drive contact our Sales Teams on 071 9106900 (Connolly's Mercedes-Benz Sligo) or 091 337400 (Connolly's Mercedes-Benz Galway).